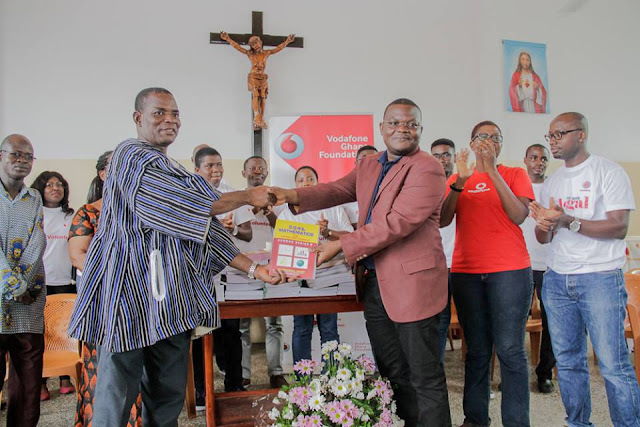 The External Affairs and Legal Department of Vodafone Ghana has presented over 150 books covering various subjects to the St. Thomas Aquinas school at a short ceremony in Accra. The gesture is in response to a TV3 news feature on the poor state of the school’s library; which was aired some weeks ago. The donation is also part of the 25 impactful community projects the company’s employees are undertaking to mark 25-years of the Vodafone Group Foundation. The team, led by External Affairs Director, and Head of Vodafone Ghana Foundation Nana Yaa Ofori-Koree, will also organise career counselling and mentorship activities for the students. The Headmaster of the school, Cyril Dadey who received the donations on behalf of the school commended Vodafone for the kind gesture. “We are more than grateful the news item carried by TV3 has yielded results and today Vodafone Ghana is supporting our school with various books covering the SHS syllabi. I can assure you that the donation will certainly go a long way to develop the knowledge of the students as they prepare for their examinations,” Mr Dadey stated.